I have a few days between visiting family and my internship starting up again so I've been hanging out with friends and finding ways to simplify my life as I head into a new year. Mostly it's involved my new Kindle and a few well-placed metal hooks. Because counter space is limited in my tiny kitchen and the counter tops are wooden, I've been placing my dish drying rack in the shower to drain. This has worked pretty well, but it's a little obnoxious to have to transfer it every time I take a shower, particularly since my showers only last about five minutes! Today I made a little adjustment that I'm rather proud of, even though it's not very glamourous. 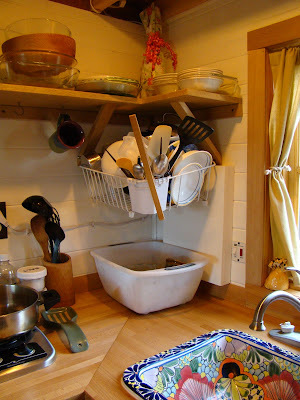 I hung my dish drying rack over my dish pan, so now my dishes are right by the sink, right below the space where they all get put away. Water that drips off the dishes lands in the dish pan which is where I stash dirty dishes until I'm ready to do a load of dishes each morning. This is further evidence that a few well-placed hooks can help to create elegant design solutions. Perhaps I can figure out a more aesthetically pleasing version of this strategy for my own tiny house, but for now, I'm pretty pleased with it. Now when I want to take a shower all I have to do is turn on the water heater and wait about 15 minutes. Granted, it probably requires more forethought than your showering process, but I'm delighted by my newly simplified system! I've found that by using the "pause" button on the showerhead I have a perfectly pleasant shower with plenty of hot water for two shampooings, conditioner, and a good scrub. I'm not sure how long my shower could be if I didn't use the pause button, but I haven't felt any great desire to figure it out with shampoo still in my hair! In other news, my cousin upgraded to a new Kindle Fire over the holidays (a xmas present to herself) so she passed on her old Kindle to me. What an ideal gift! I've enjoyed reading the books she loaded onto it. All that wait time in transit suddenly becomes time to read a novel. (On the Corner of Bitter and Sweet was a lovely northwest novel to start on the train from Seattle to Portland during a cold winter day!) I still marvel at how I can switch between different books if I'm not in the mood for the one I've been reading. The device is slim and lightweight. And it doesn't get any more cumbersome to have another book along with me. I've also discovered that a couple of the books required for my courses for next term are available in Kindle format. This is soooo cool! I realize that I probably could eliminate paper books from my life completely if I weren't a student, but I think the format lends itself more to novels than text or picture books anyhow. Three favorite cookbooks provide inspiration: How to Cook Everything, Moosewood Restaurant’s New Classics, and Passionate Vegetarian. Scrapbooks of my travels to Thailand, South Africa, Belgium, and the Netherlands keep memories of far-off lands close at hand. Nevertheless, the Kindle is a fantastic invention and I'm certain that I'll do a lot more reading now that I have one! How Many Lightbulbs Does it Take to Heat a Tiny House? 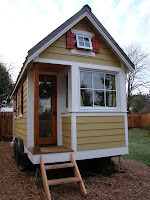 Last fall I designed my tiny dream house in a workshop called Less is More, which was taught by Andreas Stavropoulos and Dave Cain at Yestermorrow Design-Build School. As I was deliberating about heating options, my classmate John joked, "Sheesh! That place is so small you don't need to install a heater - you, your cat, and an incandescent light bulb would heat the place right up!" John had lived on and built boats in Maine for decades so I took most of what he said very seriously. But I also knew I'm a wimp compared to him, so for the last year and a half I've been paying attention to different heating options for small spaces. 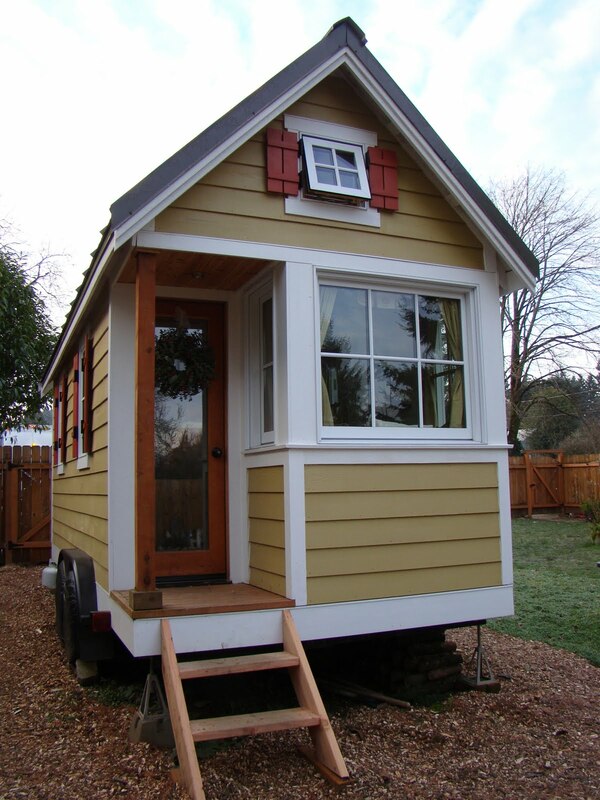 Heating seems to be a dilemma for many tiny house dwellers. Some folks love wood heat so they install tiny wood stoves and stoke their fires and call it good. 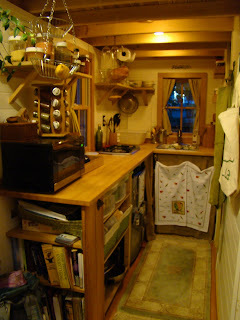 A friend of mine who is an arborist says wood is the way he'd heat a tiny house since he has a limitless supply of it. But crawling out of a warm bed to build a fire doesn't even sound fun to me when I'm camping! Besides, I'm a little pyrophobic. Even if I did like building fires I'd need to get good at it so that I could control temperatures so it was comfortable. And since my schedule often involves being gone for 12 hours at a stretch it I wouldn't be around to stoke a fire. Taking a page out of Jay Shafer's book, lots of folks have installed propane boat heaters in their tiny houses. They have great ambiance (a flickering blue flame) and they heat a space up quickly and without the mess of wood. But in order get the heat distributed throughout the room you have to have the fan on. And the fan is noisy. Obnoxiously noisy. I have a hunch that when you live in central California heat's not quite as critical as it is during the winters here. Portland has a nice, mild climate, but we still have plenty of heating degree days! Brittany installed one of these propane boat heaters (which requires clearances, running a propane line, and adding an additional penetration in the ceiling). By the time Brittany turned her little house over to me she had pretty much quit using her boat heater. Instead she had switched to a portable oil radiant heater which has a timer so that it can be set to come during certain periods. Unfortunately, it doesn't have a setback temperature so it would come on and bring the temperature up to the set temp from whatever the house had cooled down to. Depending on how cold it is this can take a while! At the end of the set time it again turns off completely. I found that it worked pretty well to just set the temp to about 60 degrees and manually adjust it whenever I wanted it warmer for a while. But it also took up precious floor space, I sometimes tripped over its cord, and it was a little clunky to have to move it every time I shifted the desk over to use it as a table for dining. So I started looking into other options. 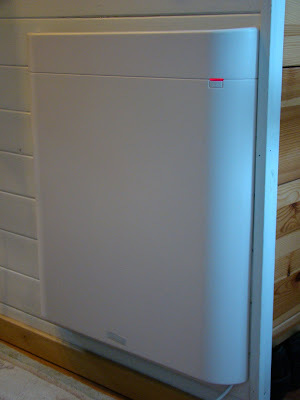 Last week my new heater arrived and, as promised by the website, installation took just a few minutes. The new heater is a wall mounted convection heater with a nice slim profile and some sort of special stack effect technology. (I understand the stack effect - I think! - but I don't see how it can be very effective in a heater that is only two feet tall, so I put it on the near the loft so that the height differential can give it a boost.) The heater is made by a company called Envi and after reading reviews for the three heaters on the market that are similar, I went with this one because there's a temperature control and the design has curved edges which I figured would help me be less likely to snag myself on it. The others also had some reviews that talked about worrisome defects and poor customer service, but it doesn't help that all three of them have very similar names. So I sprung for the one that cost $30 more. Which brings me to the notion that $130 is a lot of money to spend on a space heater - unless it's your entire heat system and then it's nothing! I like the slim profile and it seems to be heating up nicely so I'm impressed so far! It doesn't actually have a thermostat, but it does have a temperature control. I can turn it up and down as well as on and off. I can't tell what the temperature is in my tiny house. But there's only been one day since I installed it that I felt chilly (and that was after I turned it down because I'd gotten too hot). It was also right around the winter solstice. Short, dark, cold days. So for now I'm just keeping it at full tilt and appreciating that it's always warm inside my house. My friends Sarah and Jesse from Walla Walla visited yesterday, bringing their pup Dodge along. It was fun showing them the Alberta Arts District and it was chilly enough that our cocoas were a perfect warm up treat. 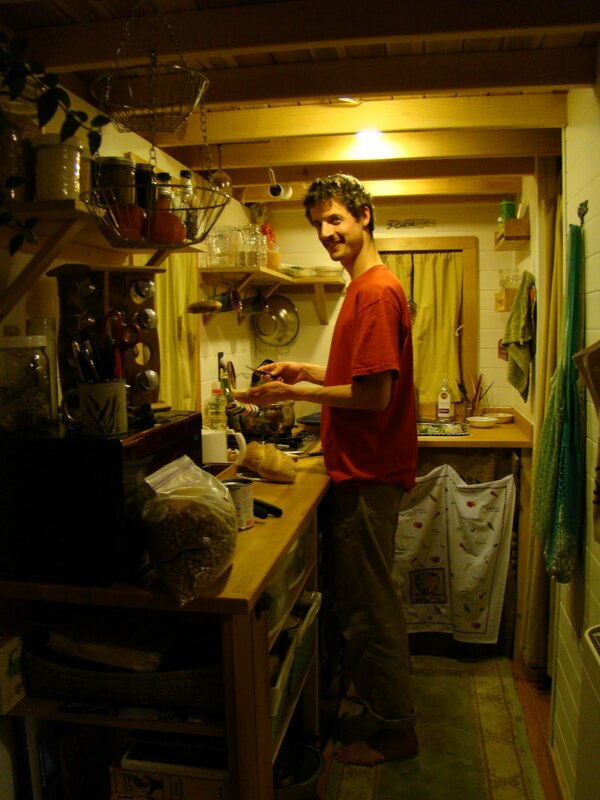 Jesse cooked us a fantastic squash soup in my tiny kitchen and he served it with homemade bread. Delish! In order to accommodate everyone for the night I moved the camping gear that I usually store in my loft over to the host house where I stashed it in a corner of my neighbor's room since she was out of town. I set up a bed for myself in the storage loft above the door with a foam pad and plenty of blankets and pillows. Raffi slept with me, Jesse and Sarah had my sleeping loft, and Dodge claimed my giant pillow chair as his bed. We all slept really well and they only tricky part is that I only have one ladder. I'd crawled into bed last so the ladder was on my side. In the middle of the night Jesse, not wanting to wake me, managed to climb down from the sleeping loft using my kitchen counter! Did I mention he's resourceful? And tall! I'm glad my tiny house was Sarah and Jesse's first stop on their road trip down to California. They live at West End Farm in Walla Walla and they left me with farm treats: pumpkin bread and apricot jam. It was a delight having my friends here even if the visit was too short. And it's nice to know that as long as everyone likes each other a lot my tiny house can comfortably sleep five! Yesterday I joined Eli Spevak, Martin Brown, and Jordan Palmeri for a workshop about appraising accessory dwelling units (ADUs). See the Accessory Dwellings website for lots more information about ADUs, including this post about appraising ADUs. I suppose I'm a bit of a nerd when it comes to housing, but I everyone there seemed to think it was really fascinating, so I was in good company. One of the things they talked about was how accessory dwellings often add value to a home because they create possibility (rental income, a space for live-in help or a young adult that's temporarily returned to the nest, or a parent deciding what the next step is after retirement). There are tons of spaces that are being rented out to singles and couples across the country. The demand is high and it's a win-win situation for home owners and renters alike. But because so few of them are permitted most mortgage companies tell appraisers to completely ignore ADUs when figuring the value of the property. This makes it tricky, of course, for homeowners considering building an ADU to justify the expense. If it won't increase their property value it's hard to make it pencil out. So many people are building ADUs for the value they bring that's not monetary. The group of folks there would like to see ADUs getting some attention and recognition as a legitimate housing option. There are more single-person households in America than ever before so it would be great to have more housing options that are legal and permitted. Another interesting aspect discussed was Jordan's research which shows that of all the different things you can do to make a building more sustainable, building small is the most effective. Now I completely understand that most people like having a little more elbow room. (A few of my friends like a little more head room than my kitchen affords, too.) But I do think the research helps create the case for building the smallest spaces that meet our needs. Today was an exciting one for me and the tiny house. A Canadian reporter named Tim interviewed me for a story about small houses. It will probably be a short video that includes information about several people living little. I'm camera shy so I don't think I need 15 minutes of fame. Fifteen seconds sounds just right to me. But also I'm excited to spread the word about how cool it can be to live in a small space, so I hope he got something that will be useful. After our interview Tim and I headed up to Rocky Butte since it was a beautiful day and he was hoping to get some footage of Portland that could be used by his news station. The view from the hilltop wasn't great because of the treetops in the way, but he was pleased with some footage of Mt. Hood. Here's the video featuring me and the tiny house I'm living in! Ever since I arrived in Portland I've been scouting Craigslist for a small used road bike. And when I say small, I do mean small. I'm just barely 5'1" so it's hard for me to find a bike small enough for me. Fortunately, my friend Sarah is obsessed with scouting Craigslist for used bikes so she was determined to find me one that was being passed on by a pre-teen. I was delighted when she sent me a link for one that I'd already found that morning: a vintage Peugeot with a 47cm frame and 540 wheels. When I called the guy he told me it was a bike he'd fixed up for his 11 year old to do some bike touring with the family. But she's 13 and has grown out of it now. It sounded perfect. I told him I'd like to take a look. "Yeah, you'll have to come ride it," he told me. "Lots of people have been interested but it's too small for everyone who has tried it." Hmm. I thought. Sounds like Cinderella's bike. So I took the bus on down to Southeast with my helmet, bike lock, and lights. I'll admit, it was love at first sight. I had a pretty good sense that if I got a chance to see it in real life I'd be riding this bike home. "She's tiny!" I said, when I saw it. "You're tiny!" he countered. It was just scuffed up enough that I figured no one would be itching to steal her. But it rode nicely, so I paid the guy in cash and headed off on my new bike, marveling at how suddenly Google map's bike timeframes became more realistic. Even though my "new" road bike is probably twice as old as my 15-year-old mountain bike, it feels positively zippy in comparison. I took it to the bike shop at REI for a quick once over. The guy said, "Well, I wouldn't have advised you to buy this bike. It's a European bike so replacing parts will be a nightmare. I'm going to suggest that you don't put a dime into it. Just ride it into the ground and buy yourself a new bike as soon as you can." I explained that I'm a grad student so a new bike isn't in my budget and I'm hoping this bike will serve my needs for the next couple of years. "Just out of curiosity though, what would it cost to get me on a new road bike?" I asked. We explored the options and figured out that short of buying a kids mountain bike and swapping out all the parts to make it a commuter, my best option was a $1200 road bike that he was pretty sure he could special order in my size. All of the sudden $120 was sounding like a pretty good deal, even if she was a little rough around the edges. Character, right? I didn't end up riding my bike home from my friend's house where I made dinner tonight because I'd like to pump up the tires first, but it was easier putting it onto the bike rack on the bus, so I'm already pleased with my improved commute! My host and some friends of hers built a bike shelter in the yard and we've put it to good use this fall! Since I don't own a car I get around mostly by bike and public transportation. There are a handful of places I can walk from my house in 10 minutes or less, but since strip clubs, tattoo parlors, and drive-up convenience stores aren't really my scene, I usually take my bike and head on down to the Hollywood District or the Alberta Arts district if I'm going to be grocery shopping or having lunch with a friend. If I'm going further than that I often take transit. I'm glad I bought the student flex pass through PSU. Even though Tri-Met doesn't do a very good job of making their passes more affordable than paying each trip (you need to take transit twice a day at least five days a week to justify the pass), it is much more convenient to have a pass than to keep an two dollar bills and one dime handy whenever I might want to take the bus. I've decided it's okay to admit that I'm a fair weather biker. Lately, I've been on the bus more than I'd like to confess to my cyclist friends who insist that all I need is better rain gear. And I get it. I do understand that the right gear makes so many things better. That's why I own nice kitchen knives, a fantastic mattress, and merino wool clothing. For several years now I've been intentionally focusing on owning less but better stuff. Living in a tiny space helps reinforce that. I like my rain pants. I've learned not to leave on my bike without them - no matter how nice it looks or what the weather forecasters say. I'm pretty good at biking when the weather is decent, but when it's not, I give myself a little grace. The way I figure it, if you have a 20 minute bike ride and five minutes in it starts pouring and you're drenched in another five minutes, you only have 10 minutes of misery before you can get dry and warm again. That's totally bearable. If you have a 50 minute bike ride, same situation, you have 40 minutes of misery. I'm just not up for it. So I've given myself permission to take the bus when it's icky. And unfortunately with the days getting shorter and winter approaching, it's happening more and more. From where I live cycling takes about 50 minutes and transit takes about 55 minutes with one transfer. I have about 8 different transit route combinations that will get me from my house to campus. But they all involve one transfer and take about 55 minutes. I have hundreds of slightly different routes that will get me to campus by bike. I've been trying different ones, tailoring them to my mood: uphills, downhills, flats, old houses, small houses, big houses, parks, waterfront, esplanade, city streets, bike boulevards, cycle tracks, bridges. So many options! Riding my bike is great because I get a work out in, too. I have time to think. I notice things from a different perspective. But I have to plan for time to shower at the gym before class or my internship. Taking transit is a nice option because it allows me time to think. Or text. Or read the news or an article for class or a novel. Or people watch. I've been riding to campus in the morning, showering at the gym, going to my classes, and then taking transit home (with my bike) at night. It's a bit of a hassle taking my bike home on transit because of the transferring, but I don't feel comfortable riding home at night for 50 minutes just after 9:30pm. Taking a bike on the train is easier than taking one on the bus, but there aren't any train stations close to my house. And unfortunately there don't seem to be any particularly pleasant bike routes to the closest Max station. Besides there aren't any good places to park a bike there and the station itself is a little sketchy. Lately I've been just taking transit both ways, which is really convenient but probably not a good long-term solution unless I figure out another way to get a work out! I've experimented with options that involve biking part of the way and then locking up my bike and taking the bus at my transfer point. That seems to work okay. It's a way of splitting the difference, using both modes. But if I take a different route home than the one I took to campus or my internship I have to remember to retrieve my bike. Dual mode travel doesn't seem to save me much time and it doesn't really give me a good work out either, so it may be the worst of both worlds! I figure I can continue to experiment. For now, it's nice having both bike and transit options. 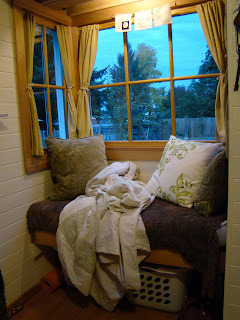 This year one of the things I'm thankful for is this delightful tiny house! I spent the holidays with dear friends in Corvallis and then hosted a couple friends for dinner on Friday evening. Yesterday a friend whose occupation as an arborist provides good access wood chips, brought us a truckload of them. He and I spread them around the tiny house and around the raspberry patch, covering the muddy spots and creating nice paths. It was a beautiful cool sunny November day and it felt great to be working outside for a couple hours. The wood chips smell fantastic and I think now that the mud puddles are covered the house will be a little easier to keep tidy. I have a shoes off rule anyhow (I think that's necessary in a tiny house!) but this way I won't be tracking mud as far as the porch. I've spent most of the last two days studying in my little window seat. Today I've enjoyed listening to the rain on the windowpanes and skylights. Other tiny house dwellers have remarked about how great it is to be more tuned into the weather and I thoroughly agree. It feels so cozy in here on a blustery day! I've started a paid internship with a planning organization so my schedule is very full these days. It makes me really appreciate the tiny house when I'm able to be home. 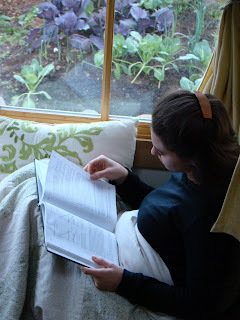 I love sitting in the window seat reading for classes with my cat on my lap, cooking hearty food in the little kitchen, or sleeping in the snug loft. I have found that the radiator heater works best if I keep it at a baseline temperature and crank it up when I feel too chilled. There is a timer on the heater but it doesn't have a setback option, so I haven't been using that feature. (It comes up to the temp you've set at the times you tell it to but then it turns off completely at the end of the period you've set and I find that if I turn the heater all the way off for a long period of time it takes a while for the house to heat back up again.) If I keep it set at 58 while I'm away and then bump it up when I get home, it doesn't take long before it's nice and cozy. I don't know yet how much electricity I'm using now that I've got the heater turned on since the electricity meter I purchase to monitor my usage doesn't fit in the outlet because of the way the plugs are oriented. I'm curious but not enough to have figured out a way to check. That will be one of my projects once the term is over. One of my neighbors recommended a heater that is installed on the wall and I'm considering getting one because it would be less obtrusive than the one on wheels that I've been using. I wouldn't have to relocate it every time I have a friend over for dinner and need to turn my desk into a dining table. I'll keep you posted about whether I decide to go for it and, if so, what I think of it. When I tell people that I live in a tiny house most of them want to know about my cooking facilities. When I tell them about my microwave, cook top, and fridge, they realize it's not much different than their kitchen. But the folks who think to ask about my toilet facilities usually keep their eyebrows up a bit longer. 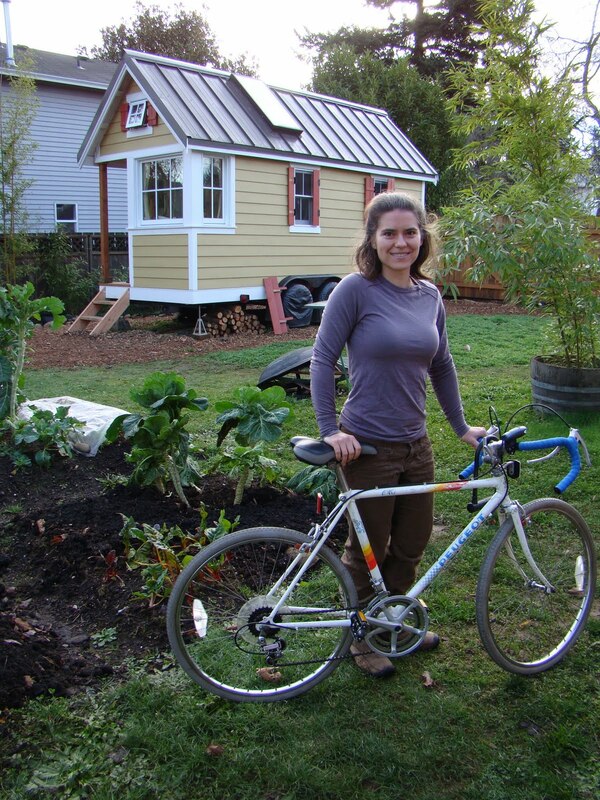 Many people who live in a tiny house use a composting toilet - either a commercial one or a bucket with sawdust. Some people line a 5 gallon bucket with a plastic bag and tie it up and put it in the garbage can each week. (If you think about it, there's a lot of human poop going into the landfills from baby diapers and elder's diapers!) Others decide to actually compost. The Humanure Handbook provides detailed directions about how to safely fertilize poop. However, my host and I decided that it would be best for me to use the toilet inside her house or at school for poo. Setting up a humanure composting system might be the last straw for the neighbors. They've been just fine with a chicken coop and a tiny house, but we don't want to push it. On the other hand, pee is sterile and it makes a great fertilizer. The garden has lots of non-edible plants so I keep a plastic pitcher inside the bathroom to collect pee. Once or twice a day I dilute the contents of my pee pitcher with water (urine needs to be diluted about 8 parts to 1 with water so it doesn't burn the plants) and dump it on the bushes outside my house. (I've found that daily emptying is necessary so keeping the container small ensures that I'm really good about emptying it frequently!) My guy friends seem to prefer just stepping outside to "water a bush," but the gals who have used my pee pitcher system said it was no big deal. The bamboo loves the nitrogen and I love the simplicity of the system. There's a whole book about fertilizing with pee called Liquid Gold. There are also periodic articles and essays about using urine as a fertilizer in the news and on blogs. I like this one called "Are We Wasting Human Waste?" 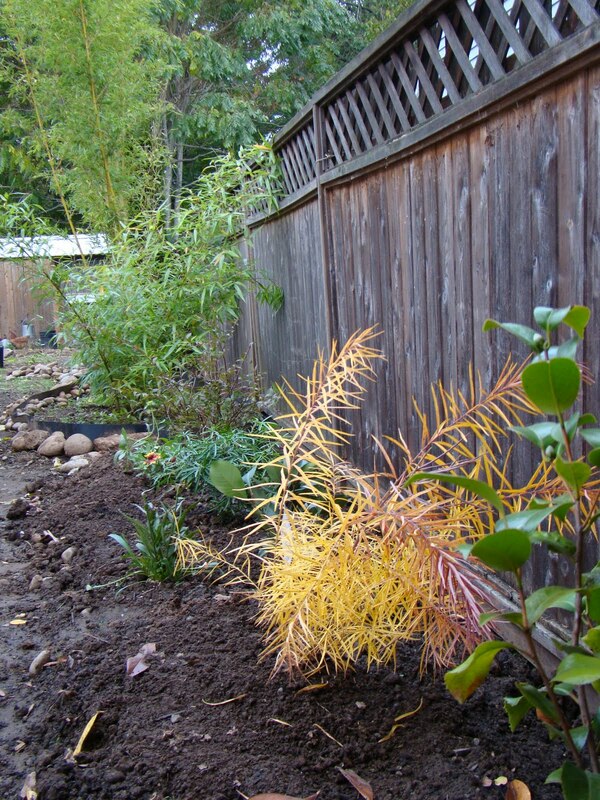 I was fascinated when I learned in a permaculture class that humans produce approximately the same amount of nitrogen in their urine each year as it takes to fertilize the food they eat in a year. There is a connection here, but it's been broken. Instead we buy commercial fertilizers, many of them using petroleum products, to fertilize our food crops and we flush our pee into a wastewater treatment system which uses tons of energy and water to process the "waste." Some people are trying to reconnect they nitrogen cycle by fertilizing edible plants with urine. I have a guy friend who found that his tomato plants grew like crazy once he started peeing on them. If you stop to consider it, it's odd that we think nothing of putting other species' poop on our food plants but we're squeamish about using our own sterile urine as a fertilizer. For now I'll stick to fertilizing the bamboo, but I'll keep watching for more research, too.